Rangers sold the naming rights for Ibrox Stadium to Newcastle and Sports Direct owner Mike Ashley for £1 two years ago, it has been revealed. The contract was struck with ex-Rangers chief executive Charles Green as part of a commercial deal that left Ashley in control of the retail department. Fans' group the Sons of Struth (SoS) have called on the board to clarify the situation. "If it's £1 it's a sad day, a very sad day," said Craig Houston of SoS. "I would ask the board to clarify and confirm or deny the story. "If they're going to deny it please tell us how much it is to give the support a bit of faith that we have got anywhere near market value, or confirm it and let us know the truth. "As a fan we will always call this place Ibrox. Unfortunately, with modern football we look to America and see what the future holds here, and it's probably inevitable to say someone will buy the naming rights. "You've just got to accept that as fans, and you hope your club goes and achieves proper value for those naming rights, especially at a time like now when we could be doing with some money into the club. "If the story is true that ours has went for £1 that's just not right." Ashley has a stake of around 5% in the Ibrox club and is understood to be looking to increase his shareholding. In 2011 he St James' Park. Ashley claimed renaming the stadium the Sports Direct Arena would "showcase" the branding potential of the club, but he changed the name back following a fans' backlash. 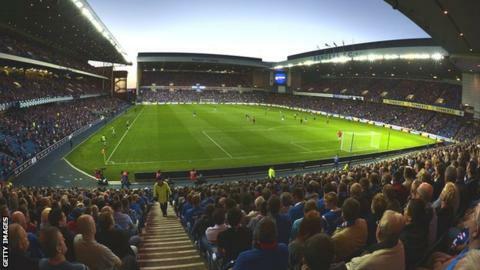 BBC Scotland understands that, despite owning the naming rights to Rangers' home ground, Ashley does not intend to effect a name change in the immediate future.